But he did not know what train Roger might be taking, and he was determined not to miss him. By a quarter after six he was seated in the Milwaukee Lunch (which is never closed—Open from Now Till the Judgment Day. Tables for Ladies, as its sign says) with a cup of coffee and corned beef hash. In the mood of tender melancholy common to unaccustomed early rising he dwelt fondly on the thought of Titania, so near and yet so far away. He had leisure to give free rein to these musings, for it was ten past seven before Roger appeared, hurrying toward the subway. Aubrey followed at a discreet distance, taking care not to be observed. Aubrey’s humor was far removed from that of the happy bookseller. In the first place, Roger was sitting in the smoker, and as Aubrey feared to enter the same car for fear of being observed, he had to do without his pipe. He took the foremost seat in the second coach, and peering occasionally through the glass doors he could see the bald poll of his quarry wreathed with exhalements of cheap havana. Secondly, he had hoped to see Weintraub on the same train, but though he had tarried at the train-gate until the last moment, the German had not appeared. 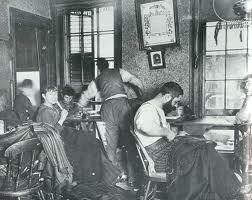 He had concluded from Weintraub’s words the night before that druggist and bookseller were bound on a joint errand. Apparently he was mistaken. He bit his nails, glowered at the flying landscape, and revolved many grievous fancies in his prickling bosom. Among other discontents was the knowledge that he did not have enough money with him to pay his fare back to New York, and he would either have to borrow from someone in Philadelphia or wire to his office for funds. He had not anticipated, when setting out upon this series of adventures, that it would prove so costly. The train drew into Broad Street station at ten o’clock, and Aubrey followed the bookseller through the bustling terminus and round the City Hall plaza. Mifflin seemed to know his way, but Philadelphia was comparatively strange to the Grey-Matter solicitor. He was quite surprised at the impressive vista of South Broad Street, and chagrined to find people jostling him on the crowded pavement as though they did not know he had just come from New York. Roger turned in at a huge office building on Broad Street and took an express elevator. Aubrey did not dare follow him into the car, so he waited in the lobby. He learned from the starter that there was a second tier of elevators on the other side of the building, so he tipped a boy a quarter to watch them for him, describing Mifflin so accurately that he could not be missed. By this time Aubrey was in a thoroughly ill temper, and enjoyed quarrelling with the starter on the subject of indicators for showing the position of the elevators. Observing that in this building the indicators were glass tubes in which the movement of the car was traced by a rising or falling column of colored fluid, Aubrey remarked testily that that old-fashioned stunt had long been abandoned in New York. The starter retorted that New York was only two hours away if he liked it better. This argument helped to fleet the time rapidly. Meanwhile Roger, with the pleasurable sensation of one who expects to be received as a distinguished visitor from out of town, had entered the luxurious suite of Mr. Oldham. A young lady, rather too transparently shirtwaisted but fair to look upon, asked what she could do for him. The young lady returned from the private office looking a little perplexed. “Have I got your name right?” she asked, showing a slip on which she had written Mr. Miflin. The girl retired, and came back a moment later. Roger was ushered into the private office, a large, airy room lined with bookshelves. Mr. Oldham, a tall, thin man with short gray hair and lively black eyes, rose courteously from his desk. Mr. Oldham looked at him, rather intently, Roger thought. “Do you want to buy it?” he said. Mr. Oldham touched a buzzer, and a middle-aged woman came into the office. “It was a man that telephoned,” said Roger. Roger was filled with confusion and anger. A hoax on the part of some of the Corn Cob Club, he thought to himself. He flushed painfully to recall the simplicity of his glee. But Roger was too proud to accept this balm, courteous as it was. Roger got away as quickly as the other’s politeness would let him. He chafed savagely at the awkwardness of his position. Not until he reached the street again did he breathe freely. They crossed Broad Street and Roger started off down Chestnut. Aubrey saw the bookseller halt in a doorway to light his pipe, and stopped some yards behind him to look up at the statue of William Penn on the City Hall. It was a blustery day, and at that moment a gust of wind whipped off his hat and sent it spinning down Broad Street. He ran half a block before he recaptured it. When he got back to Chestnut, Roger had disappeared. He hurried down Chestnut Street, bumping pedestrians in his eagerness, but at Thirteenth he halted in dismay. Nowhere could he see a sign of the little bookseller. He appealed to the policeman at that corner, but learned nothing. Vainly he scoured the block and up and down Juniper Street. It was eleven o’clock, and the streets were thronged. He cursed the book business in both hemispheres, cursed himself, and cursed Philadelphia. Then he went into a tobacconist’s and bought a packet of cigarettes. For an hour he patrolled up and down Chestnut Street, on both sides of the way, thinking he might possibly encounter Roger. At the end of this time he found himself in front of a newspaper office, and remembered that an old friend of his was an editorial writer on the staff. He entered, and went up in the elevator. He found his friend in a small grimy den, surrounded by a sea of papers, smoking a pipe with his feet on the table. They greeted each other joyfully. They lunched together at a quiet Italian restaurant, and Aubrey narrated tersely the adventures of the past few days. The newspaper man smoked pensively when the story was concluded. “Let’s go,” said Aubrey promptly. “Not only that,” said the other, “but I’ll lend you my last V. Not for your sake, but on behalf of the girl. Just mention my name to her, will you? Aubrey had no idea what Leary’s was, and rather expected it to be a tavern of some sort. When he reached the place, however, he saw why his friend had suggested it as a likely lurking ground for Roger. It would be as impossible for any bibliophile to pass this famous second-hand bookstore as for a woman to go by a wedding party without trying to see the bride. Although it was a bleak day, and a snell wind blew down the street, the pavement counters were lined with people turning over disordered piles of volumes. Within, he could see a vista of white shelves, and the many-colored tapestry of bindings stretching far away to the rear of the building. He entered eagerly, and looked about. The shop was comfortably busy, with a number of people browsing. They seemed normal enough from behind, but in their eyes he detected the wild, peering glitter of the bibliomaniac. Here and there stood members of the staff. Upon their features Aubrey discerned the placid and philosophic tranquility which he associated with second-hand booksellers— all save Mifflin. He paced through the narrow aisles, scanning the blissful throng of seekers. He went down to the educational department in the basement, up to the medical books in the gallery, even back to the sections of Drama and Pennsylvania History in the raised quarterdeck at the rear. There was no trace of Roger. At a desk under the stairway he saw a lean, studious, and kindly-looking bibliosoph, who was poring over an immense catalogue. An idea struck him. “Have you a copy of Carlyle’s Letters and Speeches of Oliver Cromwell?” he asked. This emphasis brought no surprise to the bookseller, who was accustomed to the oddities of edition hunters. “Was he a little bald man with a red beard and bright blue eyes?” asked Aubrey hoarsely. The bookseller, douce man, had seen too many eccentric customers to be shocked by the vehemence of his questioner. The tall man—and I don’t see why I should scruple to name him, for it was Philip Warner—explained that Ludlow Street was the narrow alley that runs along one side of Leary’s and elbows at right angles behind the shop. Down the flank of the store, along this narrow little street, run shelves of books under a penthouse. It is here that Leary’s displays its stock of ragamuffin ten-centers— queer dingy volumes that call to the hearts of gentle questers. Along these historic shelves many troubled spirits have come as near happiness as they are like to get . . . for after all, happiness (as the mathematicians might say) lies on a curve, and we approach it only by asymptote. . . . The frequenters of this alley call themselves whimsically The Ludlow Street Business Men’s Association, and Charles Lamb or Eugene Field would have been proud to preside at their annual dinners, at which the members recount their happiest book-finds of the year. Aubrey rushed out of the shop and looked down the alley. Half a dozen Ludlow Street Business Men were groping among the shelves. Then, down at the far end, his small face poked into an open volume, he saw Roger. He approached with a rapid stride. Roger looked up from his book good-humouredly. Apparently, in the zeal of his favourite pastime, he had forgotten where he was. “What’s the idea?” cried Aubrey harshly. “Are you trying to kid me? Roger’s mind came back to Ludlow Street. He looked with some surprise at the flushed face of the young man, and put the book back in its place on the shelf, making a mental note of its location. His disappointment of the morning came back to him with some irritation. A spot of red spread on Roger’s cheekbones. In spite of his apparent demureness he had a pugnacious spirit and a quick fist. Aubrey had expected to find a cringing culprit, and this back talk infuriated him beyond control. Roger stiffened. His beard bristled, and his blue eyes glittered. He led the way round the corner of the alley. In this narrow channel, between blank walls, they confronted each other. That instant he received a smart blow on the chin, which would have been much harder but that Roger misgauged his footing on the uneven cobbles, and hardly reached the face of his opponent, who topped him by many inches. Aubrey forgot his resolution not to hit a smaller man, and also calling upon his patron saints—the Associated Advertising Clubs of the World— he delivered a smashing slog which hit the bookseller in the chest and jolted him half across the alley. Both men were furiously angry—Aubrey with the accumulated bitterness of several days’ anxiety and suspicion, and Roger with the quick-flaming indignation of a hot-tempered man unwarrantably outraged. Aubrey had the better of the encounter in height, weight, and more than twenty years juniority, but fortune played for the bookseller. Aubrey’s terrific punch sent the latter staggering across the alley onto the opposite curb. Aubrey followed him up with a rush, intending to crush the other with one fearful smite. But Roger, keeping cool, now had the advantage of position. Standing on the curb, he had a little the better in height. As Aubrey leaped at him, his face grim with hatred, Roger met him with a savage buffet on the jaw. Aubrey’s foot struck against the curb, and he fell backward onto the stones. His head crashed violently on the cobbles, and the old cut on his scalp broke out afresh. Dazed and shaken, there was, for the moment, no more fight in him. “You insolent pup,” panted Roger, “do you want any more?” Then he saw that Aubrey was really hurt. With horror he observed a trickle of blood run down the side of the young man’s face. In a panic he ran round the corner to get Leary’s outside man, who stands in a little sentry box at the front angle of the store and sells the outdoor books. They ran back around the corner, and found Aubrey walking rather shakily toward them. Immense relief swam through Roger’s brain. Aubrey glared whitely at him, but was too stunned to speak. He grunted, and the others took him one on each side and supported him. Leary’s man ran inside the store and opened the little door of the freight elevator at the back of the shop. In this way, avoiding notice save by a few book-prowlers, Aubrey was carted into the shop as though he had been a parcel of second-hand books. Mr. Warner greeted them at the back of the shop, a little surprised, but gentle as ever. “Oh, we’ve been fighting over a copy of Tooke’s Pantheon,” said Roger. They led Aubrey into the little private office at the rear. Here they made him sit down in a chair and bathed his bleeding head with cold water. Philip Warner, always resourceful, produced some surgical plaster. Roger wanted to telephone for a doctor.